Country Save Powdered Laundry Detergent has specifically been formulated to be compatible in HE - Front Load Washing Machines. As many of you know, the new HE washer machines may also be top load. 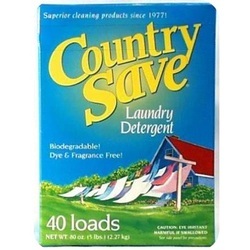 Country Save Powdered Laundry Detergent is a low-suds formula designed to work in any HE environment.It is also good to remember just what HE means. It is the shortened form of High Efficiency and it pertains specifically to the amount of water the washing machine uses. In most cases, speaking generally, it means that only 25-50% of the water used in a standard top-load washer is used in an HE machine. That explains why you only need a 1 - 2 scoop of Country Save in an HE machine... or at least you can start there and go up or down depending on your specific needs.